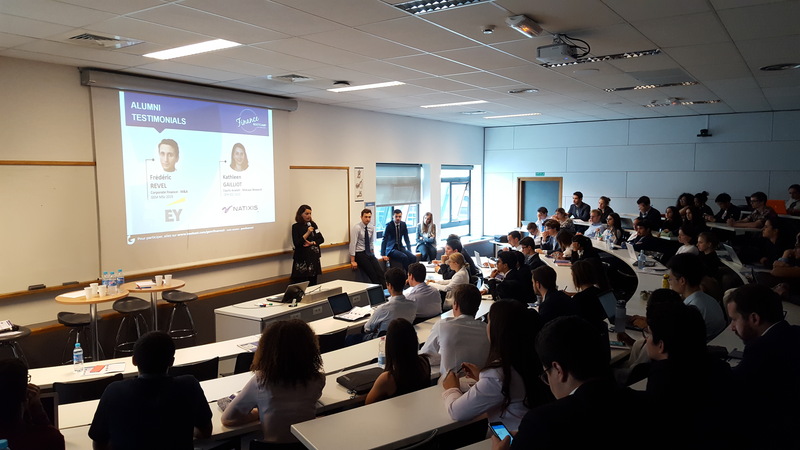 GEM finance society student Arthur Abadie reports back from his Interview with Kathleen Gailliot (Equity Analyst, Midcaps Research (GEM ESC 2010). GFS: Hello, Kathleen! Welcome to the Finance Bootcamp, thank you for coming. First of all, could you please tell us about your background and job? Kathleen: Hi, GFS! I am currently working as an equity analyst on midcaps at Natixis. I graduated from Grenoble Ecole de Management (ESC program) in 2010 where I had the chance to intern as a financial auditor at EY and as a credit analyst at CM-CIC bank. Then I joined Natixis right after my diploma as an intern in equity research and was hired at the end of it as a sell-side equity analyst on the Automotive industry. I am still an equity analyst – I love my job – but I switched to Midcaps (market cap below €5bn), mostly in the capital goods and business services industries. My job consists in issuing Buy, Neutral or Sell recommendations on the stocks that I follow (Air France-KLM, Bureau Veritas, Eurofins, Rexel, Teleperformance among others) along with a target price (6 months horizon). The aim is to provide my clients (asset managers) the information they need to make the right choice in their investments. This could be divided in three different steps. First, if it is the first time that I look at a stock, I develop a financial model about the company. I not only need to develop the historic of the company but also to talk to the management of the group to understand the strategy adopted and evaluate its future impact. Then with these data and the forecasts that I make, I value the company. I usually use a mix of different methods, the most common being DCF and multiples. Then I write what is usually a 50-page report presenting my conclusions. The whole process can take up to 6 months. Finally, I spend time marketing my investment case to my clients during meetings or calls. Other tasks in my job are to update my forecasts and investment cases by following the news-flow, attending quarterly release presentation on stocks under my coverage and to roadshow with the company under my coverage. GFS: Could you describe us a typical day of work? Kathleen: Well, I usually enter the office at 7am. I spend one hour reading the news on the papers and Bloomberg. Then, at 8am, the morning meeting starts where analysts (around 30) present their ideas to the trading room and the sales and sales traders. Then, the second part of the day starts, from 9am to 7pm, I work on my projects. It varies from a day to another but I usually work on a financial model, if I have a new stock to look at, or I work on updating my stocks information and recommendations. I also spend a lot of time marketing my ideas during calls or meetings with my clients, based in Paris, London, Geneva, New York or Canada….